See what 7,700 respondents said about comp in 2017. In talent, like marketing, perception is everything. If your employees don’t know that you source data carefully, ethically; if they don’t know that you have built a market-based pay structure; if they don’t know that you target the 65th percentile for most jobs, how can you get credit for those choices? You can’t. Whether you’re hoping to see what’s happening in incentive compensation — are bonuses being given more frequently? 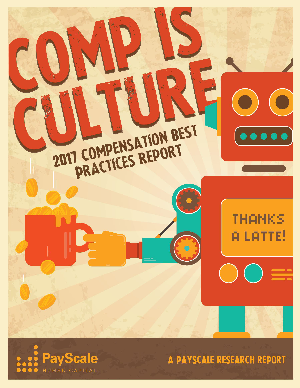 Or whether you just want to know who’s deviating from the tired old 3 percent formula — PayScale's eighth annual Compensation Best Practices Report will help you make compensation a more powerful tool at your organization to help connect rewarding your teams with building success into your culture.